Growing up as an elementary-school student in Los Angeles, Jocelyn Barahona already demonstrated a certain creativity. “I was always the kid who built her own dollhouses,” she said. Barahona – who moved to Durham in 2005 and graduated from the Durham School of the Arts – is still in the building business. This week, she receives her bachelor of environmental design in architecture from NC State University’s College of Design. Private financial support has enriched Barahona’s education and shaped her goal of improving lives through architecture. She has received scholarship support through the College of Design’s Pamela G. and Richard D. Jones Jr. Endowed Scholarship, CSI Raleigh Durham Chapter Scholarship and Friends of Masonry/Louis Sullivan Design Competition. As an NC State freshman, she applied successfully to become a Caldwell Fellow. In the fall, Barahona will start NC State’s fifth-year program in architecture. First, she’s headed to a fulltime summer internship with Bizios Architect in Durham. Georgia Bizios – the firm’s founder and a professor in the college – also will mentor Barahona as she works on schematic designs for submission to Habitat for Humanity, the international nonprofit that constructs affordable housing in partnership with homeowners-to-be, sponsors and volunteers. This spring semester, through her public interest design seminar, Barahona was part of a group of NC State students that collaborated with Durham Community Land Trustees, Self-Help Credit Union, Families Moving Forward and several local architectural firms to design rentable, affordable houses near downtown for families transitioning out of homelessness. She completed a part-time internship at Ellen Cassilly Architect, another Durham-based firm; Cassilly was a mentor on the studio project. Barahona has always enjoyed pursuits like art and photography, and visits to family in El Salvador made her very conscious of variations in infrastructure, housing and architecture. But she discovered an interest in psychology in high school and applied to several schools to keep her options open. She heard last from NC State. 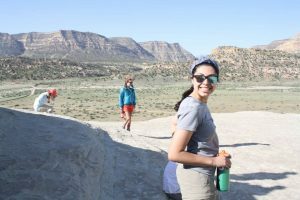 Her first year on campus, Barahona tried different extracurricular activities, searching for a smaller place within a large university. She was excited to be chosen for the Caldwell Fellows program, which provided an important, tightknit second community beyond her college and has been an all-around blessing. Barahona has worked regularly as a waitress at a local hotel to support herself at NC State, and the fellowship annually provides $4,000 toward tuition and $1,500 toward experiential learning. She has gained a lot, too, from the Caldwell program’s seminars, service-learning partnerships such as helping lead an art group in the Raleigh Housing Authority’s Kentwood community and chances to try new things. Especially impactful was a wilderness trip in the canyons of Utah, led by Dr. Jerry Barker. Dr. Janice Odom, director of the Caldwell Fellows, helped Barahona secure a grant that, along with her fellowship stipend, enabled her to study abroad. She spent the fall 2015 semester at the Prague Institute in the Czech Republic, an opportunity she initially considered out of reach. Surviving challenges, from homesickness to the language barrier, taught her a lot about herself. A lot of students at NC State really want to do something but don’t quite have the means to do so. Having [private funding] available encourages them to try – to put themselves out there and pursue something they’re passionate about.